Recently I attended the Ignite Regional Desire2Learn User’s Forum. It was the second regional user’s forum I’ve attended since Regis University has migrated over to Desire2Learn. Both of them were structured like mini conferences with attendees presenting projects they were working on, Presenter’s from D2L promoting both free and for cost feature that are available with D2L, and an MC who somehow worked in sales pitches for the for the common software that we were all there to discuss and learn about. Three of the four sessions that I attended were just like sessions one might attend at a conference, but the last session made the entire day worthwhile as Regis’ own Greg Hatayama scheduled a roundtable discussion which was much more in line with the concept of a user’s forum. As the LMS coordinator for Regis, Greg was interested in talking to other LMS admins who have had issues dealing with D2L and to discuss common problems that we at Regis knew others were having. To that point we had very little formal contact with other users and certainly no conduit for resolving common issues. Amazingly enough he had been paying attention, summarized our issues and then in what was a risky move on his part he explained the D2L side of the story that gave some background to our concerns, but never sounded defensive. It was the clearest, most coherent 5 minutes I’ve ever experienced with anyone from D2L. He concluded by suggesting that we take our group into a formal organization which could send issues to D2L voicing concerns of all Colorado customers rather than sending them through our individual account reps and TAMs which take a while to be recognized as a common issue and therefore receiving the proper attention. The summation of the session was gathering everyone’s email address which has since been added to a List Serv that will be used as common source for sharing and solving problems. A List Serv was instrumental in troubleshooting problems that arose with Angel, our previous LMS, and hopefully will be even more beneficial to us in communicating concerns to D2L. Furthermore, as a group, we now have a structure in which to meet at future conferences and user forums. If you own an iPad or iPhone you probably did the iOS 7 upgrade and then felt a little lost about certain tasks. Don't get me wrong I think the upgrade is great and I do really like how everything looks and performs but it took me a little bit of adjusting to get acquainted with the changes. The following tips and tricks might help you too. This allows you to toggle on/off your wifi, airplane mode, Bluetooth, music controls, clock settings, camera, do not disturb and orientation lock. 2. Spotlight search: swipe down in the middle (not from the top) of any home page. 3. Unclutter your notifications: go to settings>notification center to choose exactly what you want displayed and how. 4. Go Back: swipe from the left in a supported app to jump back to what you were doing. There’s no longer a limit on the number of apps you can put into a folder. You can use them to hide stock apps you don’t use, including the Newsstand. Double tap the Home button to get a look at what you have on the go. See an app you want to close? Just swipe it up and the app will close. Is the new parallax effect making you sick? Some people suffer from motion sickness and struggle to focus, but you can head into Settings > General > Accessibility and turn Reduce Motion on to ease up on the animations. You can also bold the text, make it bigger, or invert the colors in the Accessibility menu. You can now type searches in the address bar in Safari and it will return results in real time (like Chrome), both from Google and from your own Bookmarks and History. If you head into Bookmarks and tap the “@” symbol you’ll find a handy list of links from your Twitter timeline. You can also head into Settings in Safari to change various things, such as your default search engine. You could also turn on Do Not Track for a little extra privacy while browsing. When you have iCloud turned on, via Settings > iCloud, you also have access to some handy features for finding a lost device if you turn on the Find My iPhone feature. If your iPhone, iPad, or iPod Touch goes missing then go to iCloud.com and sign in with your Apple ID and password. You can see where the device is on a map, learn where it’s been, and remotely lock it. If you put it into Lost Mode, a passcode is required to unlock it (you should always use a passcode or Touch ID anyway). You can also display a message with contact details to try and retrieve it. If you fear it has been stolen then the Activation Lock feature should prevent anyone else from turning off Find My iPhone, or erasing your device, unless they have your Apple ID and password. You can also opt to remotely wipe all of your personal data. Another feature worth setting up can be found in Settings > General > Passcode Lock; tap Erase Data to ensure that your device is wiped after 10 failed passcode attempts. You can choose your wallpaper in Settings > Wallpapers & Brightness, but if you want them to look perfect with that parallax effect then you need to make them the right size. Crop your images to match these dimensions and your wallpapers should look just right. Resizing will stretch them and it won’t look right, so don’t do it. AirDrop is an easy way to share files with other Apple devices by using Wi-Fi and Bluetooth (both need to be enabled for it to work). You’ll find it in the Control Center when you swipe up from the bottom of the screen. Tap on the AirDrop section at the bottom left and you can make your device discoverable for Contacts Only or Everyone; you can also just turn it off completely in here. When you choose someone to share with, or they choose you, there’s a notification and preview giving the option to deny or accept the file. NOTE: this feature is not available on older generation iPads. You can make audio-only FaceTime calls now. It’s as simple as tapping the phone icon, instead of the video icon, in the FaceTime app. It’s great for saving yourself some minutes when you’re connected to Wi-Fi. 14. Shoot in Burst mode: The redesigned Camera app has a nifty trick up its sleeve: if you want to shoot in burst mode, taking multiple shots in quick succession, just click and hold the volume-up button. Always forgetting your glasses? Apple now lets you change the text size in apps that support the feature - all Apple apps do - so you can see what you are doing, or make things smaller of course. To change the the text size of all apps that support Dynamic Type go to Settings > General > Text Size and slide the bar to where you want it to be. 16. Additional Camera features: Shoot Square, Pano, and there are more editing features including filters. I attended a nice faculty development day conference at Metropolitan State University sponsored by eLcc on October 25th. The keynote was by Bridget Arend of University of Denver. Her main message was "be purposeful" in choosing and using technology. She co-authored a book titled "Facilitating Seven Ways of Learning." She suggests that instructors reflect on their courses and try allocating the percentage of time students should spend on particular methods of learning with a worksheet she provided (I have a copy, so let me know if you would like one). The worksheet is titled "what I hope my students learn." There are about 15 common methods listed. She says that you can reflect on your distribution and think about finding a balance to what you really wish to focus on. You can go to www.sevenwaysoflearning.com to find out more. I also went to a session on digital storytelling. The presenters were working with pre-college students but mentioned that they used a variety of tools to put together the digital stories. The first step to the process. they suggest, is to have the students focus on the story and the narrative. The instructors said that they don't place word limits on the first draft of the narrative because they will actually spend time in class to whittle down and apply some critical thinking to compose a more concise message of 300 words or less. Once they have the narrative down, the next step is to record the narrative with audacity. They highly recommend audacity because it is easy to use and the user has the ability to go in and edit the audio. The audio can be exported and then uploaded to the storytelling software. They use iMovie, and another tool that is free called www.wevideo.com. The nice feature of www.wevideo.com is that it is easy to use, free, and cloud-based. So students have some flexibility in choosing tools to edit and create their digital story. They can incorporate images with the narrative and bring the story to life. One fun thing that they do at the end of the semester is hold a "film fest" at have the students nominate their favorites and give out awards. Just in conversation with a colleague I found out about tagxedo.com. You may have heard about wordles to create interesting tag clouds, but tagxedo.com helps you create word clouds that are in shapes. the possibilities are endless. Check out the galleries they have listed for inspiration. I learned more about the functionality of one of my favorite social media tech tools, Diigo. Although I tend to use it more for personal use. I certainly has applications for using with students. Diigo is a cloud-based social bookmarking tool. Some features that I have not really tried that I am now interested in investigating are, the list tool and the groups tool. The list tool allows you to create a folder for a collection of tags. Groups allow you to push bookmarks out to special groups such as a class group. The participants may also add links for the group as well. Here is a good article from Educause that outlines all the basics of social bookmarking. Educause 2013 "Uncommon Thinking for the Common Good"
This is the first time that I have attended an Educause conference and I have to say it has exceeded my expectations. I felt as though I was on some kind of educational game show but I guess I can categorize this as a Mega conference! I estimate that there were about 5500 people in attendance, easily over 100 venders at the expo. A large portion of the conference was focused on global or campus wide IT challenges and creative solution brainstorming. The featured keynote speaker, Sir Ken Robinson, was excellent! You may have seen one or two of his Ted Talks. He focuses his message on innovation, creativity and education and the unique combination to solve big challenges that we face today and will face in the future. He has a couple of books you might want to check out: "Out of our Minds", "The Element", and "Finding your Element." 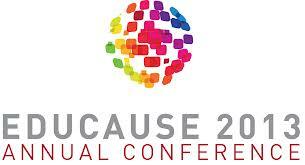 The keynote address at Educause was titled "Leading a Culture of Innovation." Sir Ken was both entertaining and thought provoking. He started with the ideas and perceptions of "culture." Sometimes when we hear about other cultures from other countries we find it hard to understand, but this is because with every culture bubble you have a context around it. We (humans) live within a framework of values and ideas. He also pointed out that most great ideas are not exactly planned. We oftentimes cannot even predict how something might impact the culture. When the television invention first came about most people didn't believe that TV would kill the radio. TV eventually did kill the radio and it changed the culture. Smartphones and devices are similarly changing the culture. We are at a point in time where we are witnessing a change in the culture of education. Sir Ken said that imagination and creativity are quite different in that you can imagine all day long but creativity is actually acting on the imagination by "doing." With creativity we add value to ideas. So going back to the culture conversation and how we might struggle to understand culture it is because we are adding out values and context to it. In general, the question might become then, when thinking about an idea, which values or who's values to you apply to it? Innovation is putting good ideas into practice. It is always funny to project into the future. Will we be flying around with jetpacks, will education be completely free, will we have personal robots, or will we have nanochips in our brains that think for us? We might think that those ideas sound absurd right now but if you have said just 15 years ago that we'd all be carrying around these small computers in our pockets and making phone calls and accessing the wikipedia for answers on a whim, we would said you were koo-koo. With education, getting degrees do not guarantee a job anymore. It is too expensive as well. Who are we serving? Who should we be serving? Sir Ken's main take away is that we need to think creatively and radically on solving challenges that will impact the future generations. I’ve been looking for a simple, intuitive e-book creator to examine the functionality of electronic texts at the college, primarily for supplemental content. And I may have found the answer thanks to a presentation done by John Raible and Amy Sugar at the Educause 2013 Annual Conference. John and Amy presented the session titled DIY eBooks Using Open Source Tools. The session featured Sigil, a free, open source ePub creator. Sigil was developed in 2009 as a multi-platform e-book creator supporting Windows, OSX, and Linux. Sigil incorporates several handy interfaces including WYSIWYG and code-based editing as well as the importing of HTML and plain text files. Sigil was formerly hosted by Google Code but is now available on several alternate sites such as GitHub and CNET. The presenters developed a nine page e-book for the presentation to demonstrate the versatility of Sigil. They suggested that an e-book be laid out initially in a word processor using the appropriate formats such as lists, tables, headings and fonts. It was also suggested to use placeholders for images, audio, and video files for later input into an e-book. of audio and video clips. The presenters also suggested using mp3 for audio, mp4 for video, and jpg and/or png for images. The placement of content into Sigil appeared to be quite easy and required minimal reformatting. Getting the e-book into the hands of students requires either an ebook reader on a mobile device or the Readium program installed on computers. The demo ebook opened without issue on my Windows 7 computer running Adobe Digital Editions. The look was clean and navigation was flawless. Sigil is definitely on the “technologies to try” list. There are possibilities for supplemental content and online training texts. Thanks to John and Amy for making us aware of another great resource. Their presentation resources are freely available through a Creative Commons license. A preconference workshop titled Creating and Distributing Content for Mobile Learning introduced MASLO, an open source app development tool developed by Cathrin Weiss and staff at the Academic ADL Co-Lab at the University of Wisconsin-Extension. Using an elegantly simple interface, I developed two simple apps in a matter of minutes. Apps can incorporate text, images, audio and mp4 video. Apps can also include quizzes with multiple choice single answer responses and feedback. The presenters suggested Amazon Cloud for storage of completed apps. Thursday’s keynote by Richard Baraniuk, professor at Rice and founder of Connexions, advocated for the open textbooks and open educational resources. Baraniuk stated that the rise in textbook costs is outpacing even healthcare and that up to 70% of students forego buying texts. His current project is the creation of 25 free college texts that will cover up to 50% of college enrollments. This step alone could save students $160 million dollars in textbook costs per year. Susan Manning, professor at UW-Stout, did a session on badging and it's incorporation into teaching. 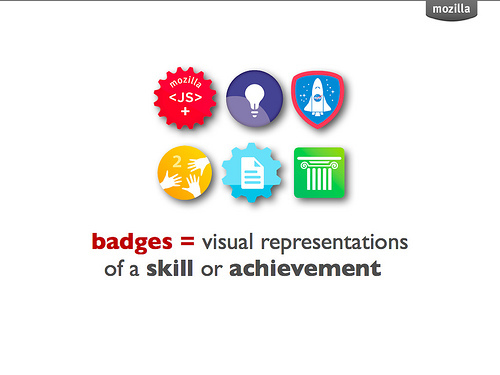 A huge takeaway from this session was the overall badging concept. 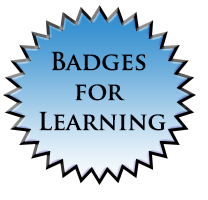 While badges can signify competency, it can also signify a number of other things such as organizational membership, attendance, and program progression. 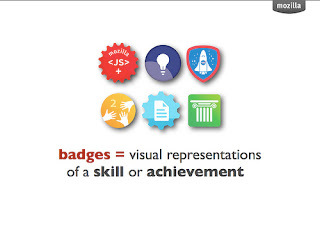 What defines a badge is not the badge itself but the underlying meta-data. When a badge is clicked, the accompanying meta-data should pop up explaining the badge purpose and other key information. An overarching industry concern is the issuance of meaningless badges that may dilute their significance as a symbol of accomplishment. The use of comprehensive and well-defined meta-data will provide much needed context. Locally, the next step is finding a badging engine such as Mozilla Open Badges for the storing, tracking and displaying of badges. Chris Ament, Director for Academic Technology at the University of Minnesota, discussed a new centralized support model for academic technology currently being implemented at UM campuses. The new model integrates all support areas from across the university into one centralized unit. This has reduced duplication of resources and increased awareness while providing better access to support staff. Their approach was to first identify centers of support excellence and to capitalize on these strengths. They then assessed areas of greatest need and emphasized areas that would provide “quick wins” to justify moving ahead. Each academic department provided input on the support skills needed. A key challenge to full implementation of the new model was designing a fair method for prioritizing the multitude of requests from five campuses and multiple colleges. The support process also needs to be transparent to customers. This was one of the best sessions attended and provided key insight as we begin centralizing our own academic support units. V10.2 – knowledge/information gained from talking to others who have upgraded. Also, having the ability to have the hands on experience using the new version during some of the sessions. Support Meeting: I came away feeling like D2L really cared about Regis. Had we not had the meeting I doubt that we would have received the “free” refresh of our test server. Collaborating with others, talking about how the system is used, managed, courses developed, etc. PRICELESS. Surviving Your Next Upgrade – presented by Vida Barker, Centennial College of Applied Arts and Technology: The session provided a great deal of insight to the upgrade process: things to considers, strategies for mapping changes from the test server to the production server as well as some new ideas for informing and training faculty. Semester Start Planning –presented by D2L: the analysis of issues and strategies that D2L is putting into place to resolve term start issue. The Change Freeze that has been put into place. Account Manager: are we not being informed of these changes because we do not have an account manager? Support: D2L is putting a lot of things into place to provide better support. However, they have not addressed major issues that were identified a year ago (at the last conference, through tickets, etc.). Rapid Version Changes: many are worried that too many changes will come too fast and that existing issues will not be addressed. Forced upgrades because older versions will not be supported. Town Hall meeting for faculty: a strategy for showing and informing faculty of the changes in the new version. This would not be a training session, just a show and tell with Q&A. Term Start documents developed by D2L. We should incorporate those items/documents into our processes. · The collaborative networking with other faculty as well as tech support to gain numerous tools and tips was extremely beneficial. I was energized and wanting to learn more each day that I attended the conference. These tools and tips ranged from things to enhance student learning through gamification, apps, and websites to ways D2L can enhance student learning as well as instructor efficiency through rubrics, assignment grader, etc. · Being able to work in the sandbox of the new version we will soon be adopting: 10.2. How to build and use competencies and rubrics within D2L. · D2L Assignment grader: This app appears to increase efficiency for grading. · Respondus lockdown browser upgrades: We now have 200+ seats available for webcam monitored testing. This can enhance monitored testing for faculty when needed in emergent situation. · Kaltura app – This will allow students and faculty to upload videos to D2L with the app. This can be very beneficial for multiple reasons such as autonomy and flexibility. · The new version of D2L is very different from our current version. It does not look like our current version at all. It did not seem intuitive at first and was difficult to find items. After working in it several times, it did get easier. · The fact that rubrics have been available in D2L all along and I was not sure how to use them. I use rubrics in word to grade assignments; however, using them within D2L is much more efficient. · Seeing and hearing different methods of teaching and learning as well as tools/apps utilized. Gamification is something I am interested in utilizing. The session I attended had some good initial data to support the use of gamification. Use of verbal recorded feedback in dropbox. The 10.2 upgrade is going to present a great opportunity for online faculty and students. New tools and the re-formatting of existing tools will offer greater efficiencies and the ability of users to customize their work flows. · Intelligent agents coupled with release conditions and replacement strings can assist instructors in providing more personalized feedback to students in a timely manner automatically. · Analytics, which will become “Insights” in 10.2 will be much more useful to faculty than what is currently available. Meeting with support team from D2L was excellent dialogue. Regis’ concerns were laid out and reasonable explanations were offered as to why some of the issues that other users experienced won’t be problems in our upgrade. The fact that they were high up in the support hierarchy took away the concern that it was just a sales pitch and they discussed openly what their concerns were and how they would approach them. Meeting Nick was a bonus, but it also gave us the opportunity to openly praise him to others in his organization which I think is important as it showed them that we recognized and appreciated the excellent support we received. 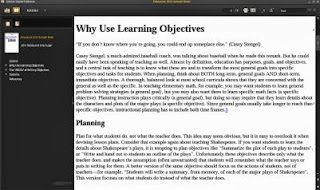 · The Binder app could be a very useful tool for students. Though just for IPads currently, it will become very useful to students as it becomes available to other browsers. Could be especially useful to the PT iPad initiative. · Approach training with a theme and collaborate efforts rather than approach in our silos. · The Vendors Top Hat has a student response system that utilizes student owned devices that eliminates expensive clicker systems. The pickup involves a dedicated browser that doesn’t result in data charges to the students. Drag and drop will be a wildly popular time saver, but it is going to wreak havoc on the back end file structure. Drag and drop will simplify the upload process, but the uploaded file is simply dropped into the root folder. It is very likely that faculty either through ignorance or lack of concern will ignore the backend file structure all together which will lead to difficulties in managing the content. This will need to be addressed in training. · Use training to cohesively train not just in what’s new and how to use, but to also train to avoid creating identified problems in our workflow. · There are additional issues with the change that may create new problems, but knowing and anticipating them will give us the opportunity to assess how we can try to prevent them with training. · Utilize Insights to identify struggling students early and support them to be successful. Interventions can be as simple as encouragement or making students aware of existing resources that target their needs. I had the opportunity to talk to the support guys at Fusion to discuss two issues I had been working. This turned out to be a really good discussion. There is an issue with the group settings not copying into live courses. This requires instructors to setup their groups each time the course is taught. This turned out to be a bug and the support team is going to be investigating. Dr. Alec Couros the keynote speaker provided a great presentation outlining where technology has been years ago and where it is today. Students learn much different than we did, they will look at YouTube and other resources to solve problems or how to learn certain tasks. As designers and developers we need to start looking at how students currently learn and not how it’s always been done in the past. We had a meeting with our Technical Account Manager and director of support and it was very informative. We learned that we will be keeping our Technical Account Manager. We had a great discussion regarding our Test Server. They are going to copy all our third party apps and about 15 courses onto our test server. The test server will then we upgraded to 10.2 and this will identify any issues that will occur. This will be a huge benefit for the administrators of the colleges. Kaltura D2L Integration – The integration has been improved in 10.1. Users can now upload and embed video from with the insert stuff menu. Kaltura app – They have an early beta app allowing admins, students and faculty to upload videos to D2L with the app. Stay tuned for the app this fall. · Respondus monitor – Respondus integrates with lockdown browser to add webcam and video technology for proctoring students not present in the classroom. Regis currently has 200 available seats with Lockdown browser. · I attended a session on delivering an environmental course on the Ipad. The presenter said the IT department had to make some upgrades to the network infrastructure to support the increase in Ipad usage on the network. This was surprising and makes me think if we need to make any upgrades to our network. · Uploading documents to D2L from the Ipad has been unavailable with the exception of pictures from the Ipad camera. I had the opportunity to talk one of the support folks and he said the reason is how the IOS operating system is set up. Apple would need to modify the coding in the operating system or an app would need to be developed. The Samsung Galaxy tablet does not have this issue. · I attended a session on mobile and the use of apps. The presenter provided us some development that I want to investigate to determine if its applicable for Regis. The apps are Appcelerator and Sencha. For experienced developers Jquery mobile is one that should be investigated.